There’s nothing new in the fact that we all like to have a little fun, some enjoyment. 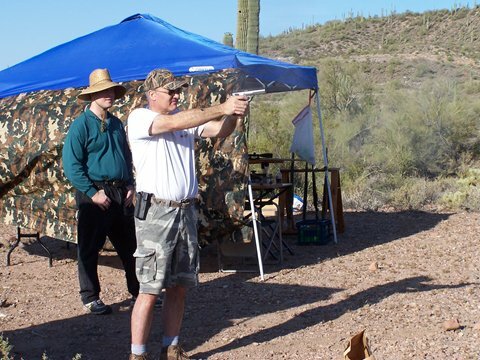 When it comes to guns and shooting not everyone shares the vision that they can be fun. I’ll bet serious money that the ones that don’t think of guns and shooting as fun are those who have never tried to discharge a firearm, and/or those who know of someone who was seriously hurt, or worse. Fact remains, however, that sporting arms exist for that very reason, to have fun with them. People would not spend their money otherwise. So, how is enjoyment extracted from an object called a sporting firearm? Nobody would have all the answers. Here are a few. Like many human creations, a firearm, in the end, is a genius design to vastly improve on throwing an object, certainly with the objective of hitting a target. Today we can deliver tremendous energy at significant distances. No doubt the designers and engineers had fun converting their dreams into reality. And likewise, there are folks who simply enjoy firearms on their own merit, never ever firing a shot from them. We call them collectors. The majority, however, are consumers. We like to use the darn things. Males in particular like to be powerful. Big trucks, chain saws, power tools, jet engines … those things speak to our hearts. And guns fit right in. Then we refine. 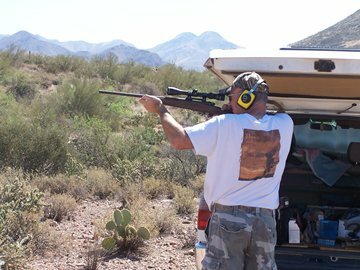 One avenue is plinking, the very basis of enjoying a firearm. 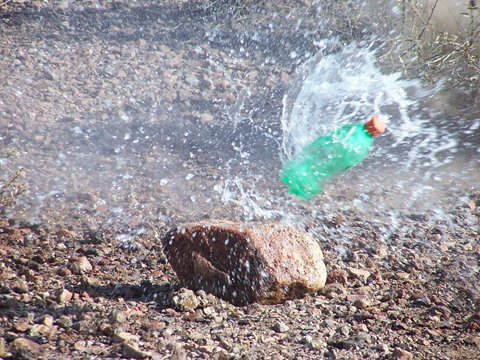 Targets span from bottles (what can be more fun than breaking, blowing up when hit? – but please do not use glass bottles, too many shards disfigure places where people go shooting) to the famous paper plate. In fact, isn’t the target the most critical piece of equipment when we pursue fun? Let’s take a closer look. Paper targets come in seemingly endless shapes and configurations. It tends to be inexpensive. Paper has the stigma of being boring. But don’t tell that to the bench rest folks. Placing five shots into one tiny ragged hole at a hundred yards (or even further out) is their weekend joy. It is also a heck of an accomplishment. The action notches up quite a bit when that paper target moves. Too bad the running boar range at BASF is out of order. Despite the lack of success, way more misses than hits, every one who tried the running target game enjoyed it. Paper does this for us: it records, compares, verifies. In fact the key point is that paper does not lie. We tend to, regarding our groups, want to dismiss certain flyers or flinching or wind gusts. Of course, next to nothing happens when we blow lead through paper, leaving only a small hole. A step up from that are those targets that change color when hit. 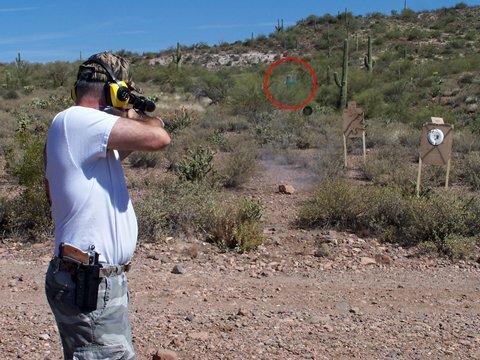 Yes, unless we use high-power optical equipment, we need to walk out to our paper targets to determine where the bullet(s) went. Next would be a steel plate. To a limit it can tell us where we hit, where the bullet splashes. It can also give us sound feedback through ringing and visual indications through movement. Silhouettes and pepper-poppers fall down. Steel plates work best with handguns and multiple shots, providing immediate hit-or-miss data. They do not need to be taped back up, and last almost forever. Steel tends to be more fun because something happens when the bullet hit. Noise, movement and bullets splattering. We can register that from where we shoot. King of the plinking game is the (t)rusted tin can! Hit one of those and it will move, bounce, or go airborne. It can handle multiple hits, and of course costs nothing. For added excitement, fill one up with water. Depending on what you’ll hit ‘er with, that water goes from splash to instant vapor, ripping the can to pieces in the process. And yes, as they’d taught us so often from Hollywood, we can blow them off fence posts as well. Clearly a reactive target! In a deviation from the theme we once held a little contest with ‘power transfer’ targets. The idea was to launch a five-inch piece of 2x4 as high (not far) into the air as possible. The ‘launch pad’ was a tin can. Competitors could choose how to treat their can. Most filled them full of water, some may have filled them half with sand and topped them off with liquid. Fired at from fifty yards, in a field that included a .308 Winchester and a .300 Remington Ultramag, the winner was a .223 Remington, sending the chuck of wood at least twenty feet up. Gerhard relaxing with his CZ TS 9mm. Don’t overlook wood. It can be quite entertaining to play woodchuck with your armament. Old, worn-out bowling pins are regularly used for plinking and competition, shooting against the clock to clear some off a table, for instance. They are tough, hold out for more solid hits than you know. Construction lumber serves as great consumable targets. Centerfire handgun bullets tend to rip big chunks out of those, sending them hurling. 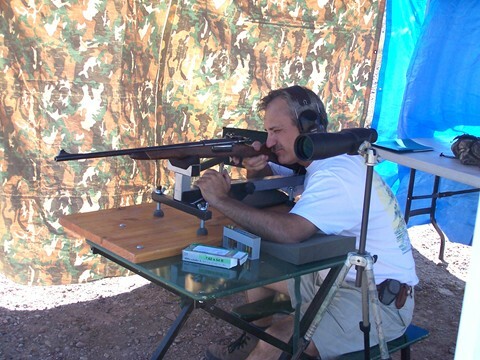 Stand a 2x4 section upright and shoot it in half – amazing how many hits that requires. Taking turns, it easily affords a little competition. Things like paper, steel, cans and lumber are target material you bring with you, and hopefully take back out when you’re done with them. Nature also provides some reactive targets. 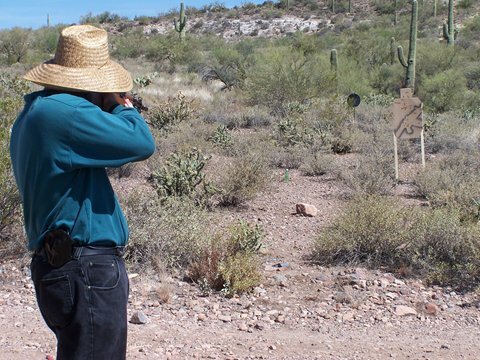 As always, be especially aware of this safety rule when shooting outside some place other than a dedicated range: Be aware of your target, and what is beyond! 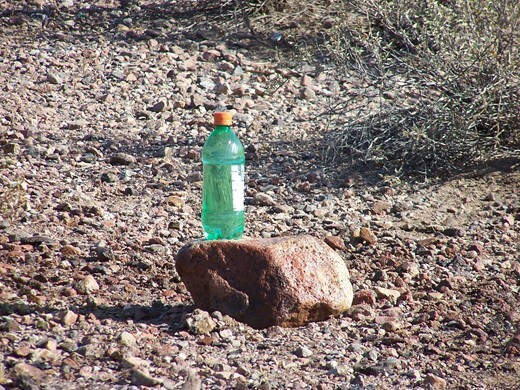 Rocks, we have billions here in Arizona, can make a great targets. As with water, do mind the potential of ricochets. 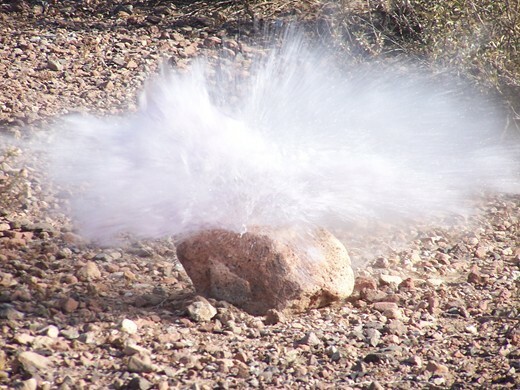 Rocks either move, chip, blow apart or take a mark when bullets impact. Plus they come in all kinds of sizes, at just about all distances. And since nature also offers all kinds of wood, be creative – no, be safe first, and then creative – when you want to have a little fun outdoors. All these targets have one thing in common. They become more fun if we actually hit them. If the game becomes too challenging, why waste the ammo? Speaking of fun, here are a few examples of spending a lazy Saturday morning in the desert. The pictures tell you what type of targets we ‘engaged’. No competition, just blasting. And of course, Dan had triggered his camera with perfect timing! Not everyone out there was a good guy. Subject: HSC: Need a story! It's time for me to start putting the next newsletter together, but I don't have an anchor story. So I thought that I'd send out an email to past and potential authors to try to shake the bushes a little. I need something in the next week to two weeks. If you don't have a story, do you at least have an idea for a story that someone else might be able to pick up on? Help! Subject: RE: HSC: Need a story! Darn, if it wasn't already starting to get hot, it would be fun to call together an impromptu plinkenfest out in the desert. Get a bunch of guys together with coolers, shade, guns and targets of choice and have at it. A day out plinking could easily generate enough pictures and prose to create an anchor story. time. Yes, we set up some refuge from the sun. Gerhard quickly answered back that he was available on Saturday morning. Who wants to go? The plan was hatched that quickly. In the end there were only three of us that showed, Gerhard, myself, and Paul, a buddy of Ger’s. a little recoil. Note the hostility lurking in the desert. The night before, I started picking through the Martinez armory deciding what I wanted to play with. Mostly I grabbed a number of rifles that don’t get out of the safe all that often. Whether it be for competitions or for hunting, I will usually carefully consider what is the best tool for the job. 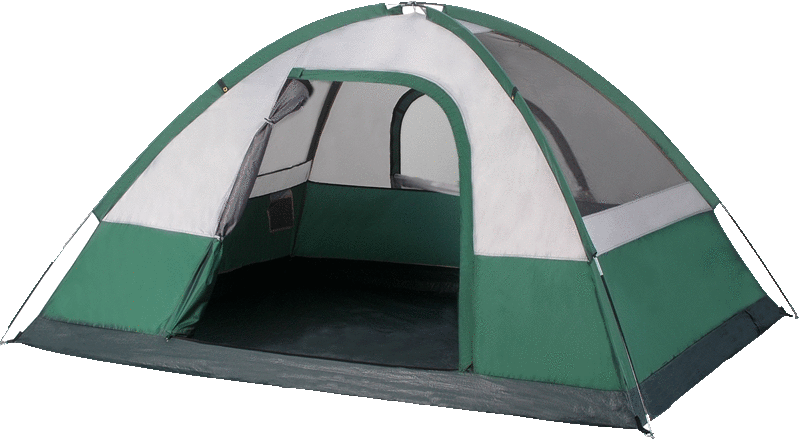 A plink-party though, frees you up to bring out whatever you think you’ll have the most fun with! There are no adverse consequences to clutter up your mind, like losing a match or missing a game animal. How liberating! 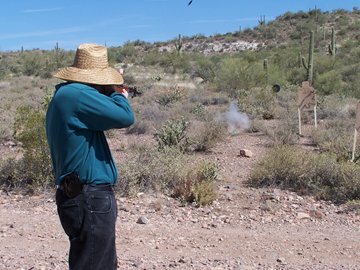 And just like you are freed up to shoot whatever gun you want, it is also a great opportunity to burn up any old ammo you might have cluttering your ammo inventory. For example, maybe you have some ammo that just plain does not shoot very well in your guns. You wouldn’t use it in competition or on a hunt, so it just languishes in your ammo vault. I have way too much cheap 7.62x54R corrosive com-bloc rifle ammo that fits this description! 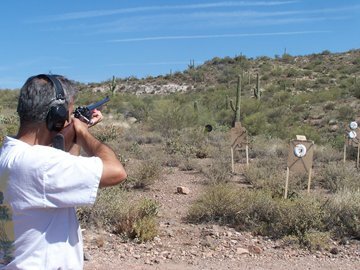 Originally, the plan was to meet up at a spot west of Lake Pleasant where just a couple of months ago we held an impromptu 3-Gun Desert Action Shoot. When we arrived not long after first light, we were greeted by some new and not so friendly NO TRESPASSING signs. “This area closed due to littering.” No shooting, no this, no that. than that 4-wheeled device with the same name. It was quite true. Slob shooters before us had made quite a mess of the place. Why, oh why do people bring out old appliances and other crap, shoot the trash full of holes, and just leave the whole mess? It’s enough to make you want to shoot these slobs full of holes and leave them! 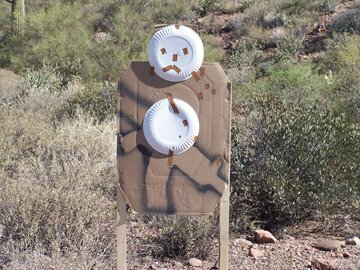 Please, please, when you go out desert plinking, use targets that don’t leave a mess and take them with you when you leave! My own favorite reactive plinking targets actually do not plink – but they do blow up rather nicely! I like to use plastic soda bottles that have been refilled with water and capped. I always remove the filmy plastic label before shooting them. These bottles almost always stay in one piece when shot and are easily collected after the carnage occurs. The labels usually shred and spread with the wind which is the reason I remove them before blasting. So after deciding which guns and ammo were going, I packed up a crate of plastic simulated prairie dogs. That green thing from Mars is in trouble! After learning that we couldn’t shoot at the planned venue, we conferred and decided to go out to one of my other secret spots that’s always a good bet. After a short caravan, we arrived at the backup spot and started setting up. Setting up the shade canopy, complete with tarp side curtains, is always my first order of business. Yeah it takes a little extra time, but I don’t have to tell any of you guys how brutal summer in the desert is. With this setup, I can endure a full day of load testing and chronographing if that’s what my goal for the outing is. A cooler full of liquids, lunch and snacks is the other important element. Set up some tables, spread out some chairs -- I make myself a right comfortable little abode. Gerhard and Paul got to work setting up some cardboard silhouette targets and some steel swingers. I broke out the plastic pasture poodles and set up a target frame at 120 yards with a paper target from the club’s website. Mini Mauser .223 “one”, rock “zero”. The 4Runner can provide vital shade for one. Paul brought out an incredibly light, 5-shot S&W scandium carry revolver. I couldn’t believe that the thing was rated for full power .357 mag! I got a chance to light off a few mag rounds in this gun. I can report that recoil with the magnum load was quite “sting-y”! It seemed to hit where you pointed it just fine, though. Let’s see, I don’t think I’ll be able to remember all that Gerhard brought out, but I know that he had his 9mm CZ competition pistol, a Ruger 10-22 that he can make sound like a full auto, and a mini-Mauser in .223. As for myself, I brought out a passel of old military rifles, a recently acquired Remington M600 in 6mm Rem, another Remington, a Model 700 varminter in .260 Rem, and my Springfield GI model 1911. We all traded back and forth freely. Gerhard launches a bottle about 8 feet into the air. 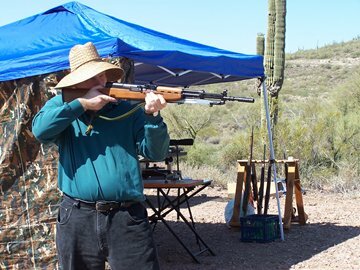 One of the old military rifles that I brought out proved to be a big hit with the fans: a Yugoslavian M59/66 SKS. I picked this one up from J&G Sales in Prescott a couple years back. With folding blade bayonet, and a NATO-spec grenade launcher and grenade launching ladder sight, the cool-factor is big! And since it can spit out 10 rounds of cheap ammo as fast as you can pull the trigger, what’s not to love? OK, precision accuracy it does not possess, which is the biggest reason it doesn’t get out much. But for a plinkenfest such as today, it was perfect. After a little paper punching with the handguns, it was time for some serious fun: high powered rifles against plastic pasture poodles! One of Gerhard’s goals, that he wasn’t sure we could pull off, was to try to get a photo of an exploding reactive target. I’m not sure exactly what he had in mind, because he didn’t know that I was bringing my pop bottles. … with no idea that a 6mm hollow point was about to visit! Anyway, I set up the camera on a tripod, zoomed in to the target, and with Paul counting “one … two… three”, Gerhard tripped the trigger while I worked to simultaneously trip the shutter. It took a few tries, but I think we got what we were looking for . . . in spectacular fashion! We arrived pretty early, and since the day was warming up nicely, by around 9:30 we were done. Gee, we gotta do this more often!